Out comes the begging bowl again! AS WAS predicted by narrowboatworld, Canal & River Trust has brought out the begging bowl again, expecting the public to pay for the breach on the Middlewich Branch. Alas, if past efforts are anything to go by, it will be doomed for failure, for as in the past, the public will believe it is the Trust that should be paying for its repairs. But it seems it cannot, especially now, putting itself so in debt to need a £100 millions loan to cover its runaway spending. 'To put this figure in context, it is significantly less than the amount spent on 29,460 balloons and 48,750 metres of bunting for CaRT's launch—that were never used. It is less than 20% of the amount that CaRT is spending on 'potty poetry' and other art projects'. 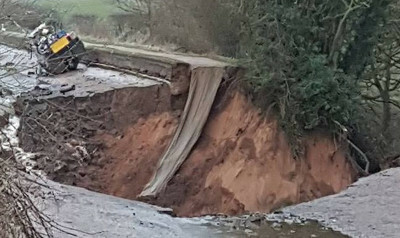 That breach should have been paid for by the contingency fund, but then it had gone on the breach on the unconnected Montgomery Canal, so if the public is being asked to finance, the fund has obviously gone once again, we know not where. 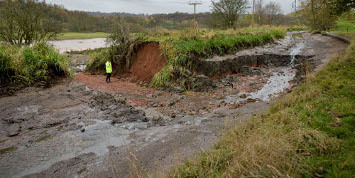 Though it is stated that breaches are rare, in addition to the major one on the Montgomery (of which there have been many due to its sandy soil) there was a further breach on the Trent & Mersey then a major one on the Caldon Canal, (pictured) in addition to less dramatic breaches. 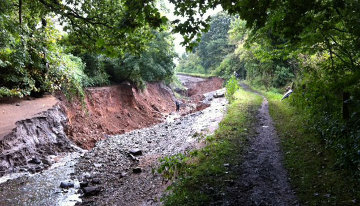 There were two last year—one at Appley Bridge on the Leeds & Liverpool and another at Bollington on the Macclesfield. They are certainly not rare. So the Shropshire Union Canal: Emergency Appeal has been launched, with CaRT stating 'to help people who use the canal—whether it's using the towpath to get to work or school, visiting to get some peace and quiet or boating on the 200 year old waterway—to do so again'. A dam has been installed across the waterway downstream of Stanthorne Lock, so that when pumps arrive these will be used to pump water out of the Trent & Mersey Canal to re-water the drained section to enable the stranded boats to lock down on to the Trent & Mersey. There has been no intimation when any work will commence on the breach, but it obviously will not be any time soon. In the meantime, don't attempt the Four Counties Ring.